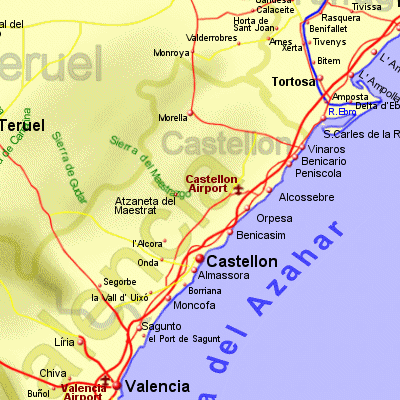 Castellon province, the most northerly provence of the Valencia region, and includes most of the Casta del Azahar, or, Orange Blossom Coast. Inland, the province is surprisingly mountainous (one of the most mountainous provinces in Spain) but there is a fertile coastal strip where fruit trees are grown (and where most of the population live) and a coastline has glorious sandy beaches, historic towns and fishing ports. At the northern tip of the province, against the border with Catalunya, you will find the town of Vinaros, with its large harbour and fine sandy beaches. These beaches are wide with space for everyone, only the popular central beach, Al Forty, having any danger of becoming crowded at busy times. Further south, the resort of Benicarlo has history, having been founded by the Moors, and also the Bronze Age ruins of El Puig lie nearby. However, Benicarlo is also a modern resort with wide sandy beaches. A little further down the coast, and joined to Benicarlo by a wide sandy beach, is the modern resort of Peniscola, well known for its old town and castle perched on a rocky headland, almost surrounded by sea, with a harbour to one side. The old town has a maze of narrow streets between white-washed houses. You will also find a good selection of restaurants around. Further south beyond the Sierrs de Irta, the high rise resort of Torreblanca, the wetlands of Parc Natural del Prat de Cabanas Torreblanca, lies Benicassim, a mmodern tourist destination popular with the Spanish. A little further south, lies the capital city of Castellón de la Plana (la Plana being the fertile plain surounding the city), a small city with medieval origins, located approximately 5km inland from the sea and the industrial port area. Castellon province benefits from the rail line running near this part of the coastline, having regional and fast trains (the Euromed) running north and south. An airport is under construction near Castellon and is expected to open during 2011.